Evelyn Vanderloock’s collections come in standard sizes 54, 56 and 58, and the Unisex range also has male sizes 60 and 62. If your ring size is not one of our standard sizes, simply let us know your size in the order email. Please note that custom-made sizes cannot be returned. We’re happy to send you a little plastic ring sizing gauge, free of charge. This ‘Multisizer’ works like a little belt: you simply slide it around your finger and it snaps in place at the right size. Please make sure that you can still slide the ‘Multisizer’ over your knuckle. Fingers on your right hand often have a different size to those on your left. Make sure you measure the finger on the hand you want to wear the ring on. 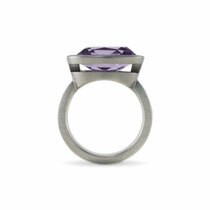 Wide rings should be chosen slightly larger than slim rings to guarantee the most comfortable fit. The same applies when you like to wear several rings on the same finger: please choose a slightly larger size. In summer your fingers might be slightly thicker than in winter – the warmer it is, the thicker your fingers will be. Your ring size will vary during the day: in the evening our fingers are usually thicker than in the morning. Ring sizes can vary over the years. Don’t rely on a ring size measured a long time ago. This table helps you to determine your ring size. The inside diameter you measured corresponds to a ring size. If for example you measured an inside diameter of 15 millimeters, ring size 47 will fit you.